The city of Clarendon Hills, Illinois, has begun issuing zombie hunting permits. A permit system is typically used to limit the amount of something. Which raises an intriguing question: why does Clarendon Hills want to reduce the amount of zombie hunting? Apparently, there must be too few zombies! This is not as absurd as it sounds. 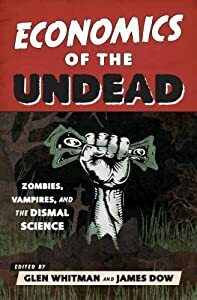 As Michael O’Hara argues in Chapter 16 of Economics of the Undead, “Zombies as an Invasive Species,” one potential solution to a zombie infestation is to encourage people to hunt zombies for sport. Initially, while the zombies are numerous and out of control, you wouldn’t want to limit this activity. But if zombie hunting became popular enough, then the zombies could be hunted into extinction — which would mean the death of a popular and enjoyable pastime. To prevent the overhunting of the zombie population, you would need to establish private zombie-hunting preserves (as O’Hara suggests) or government-issued zombie-hunting licenses (as in Clarendon Hills). Another possibility is that the Clarendon Hills government may have determined that zombie-hunting produces positive externalities (benefits to people besides the hunters), but also negative externalities (costs to people besides the hunters) — possibly in the form of accidental killings of uninfected people. If the bad externalities exceed the good ones, then you might want to place limits on zombie-hunting. But this seems unlikely in the face of a serious invasion. This entry was posted on Friday, October 10th, 2014 at 10:21 am	and posted in Uncategorized. You can follow any responses to this entry through the RSS 2.0 feed. What is the optimal number of zombies? Our friend Glen Whitman makes the case why this number might be greater than zero.